The Lat Pulldown Exercise is a great way to build strength in your shoulders, back and biceps. 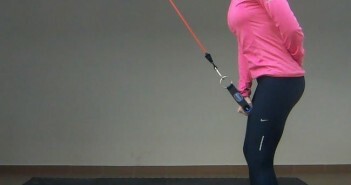 The Lat Pulldown Exercise forms part of the Golf Strength and Endurance series of innovative and dynamic exercises that are designed to efficiently increase your stabilising strength – supporting proper body alignment, movement patterns, and energy transfer within the golf swing, and helping to prevent injuries. Figure 1. Lat Pulldown Exercise Video. Start by sitting on an exercise ball, holding a resistance band in each hand that is anchored above you, your arms straight above your head and your palms facing away from you. Pull your arms down until your hands are at shoulder level. Initiate the movement by sliding your shoulder blades back and down, and then drive your elbows towards the ground. You should feel it working your shoulders, back and biceps. You can perform the same movement while sitting on a chair or bench, or by kneeling on a mat with your buttocks on your heels.